Editor's Note: Olivia F. ('20) submitted a lab report she did in her sixth grade science class. What does the size of the original triangle represent? How do the perimeters and areas of the bottled water and tap water triangles compare to the perimeter and area of the original triangle? The original triangle represents the maximum rating for the three “E’s” or what the perfect sustainability would be like. The bottled water and tap water are significantly smaller than the original triangle because the bottled water and tap water triangles were not as balanced, due to requirements of the three “E’s” that they fulfill. Its important to measure the area and perimeter of the original triangle so that you can use it as a basis for what sustainability should be. 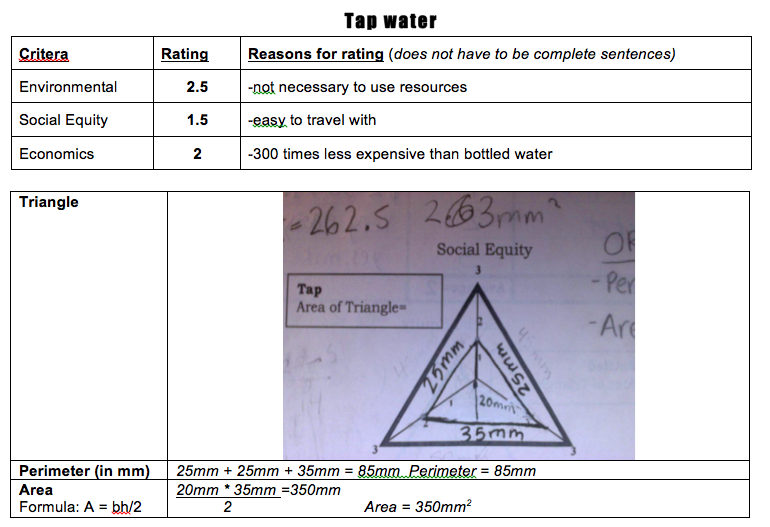 How does the perimeter and area of the tap water triangle compare to the perimeter and area of the bottled water triangle? Answer: For the tap water triangle the area was 350mm2 and the perimeter was 85mm. The bottled water perimeter was 73mm, with an area of 225mm2. The bottled water had a smaller area and perimeter because overall it fulfills less of the requirements to have a three in each of the three “E’s”. Tap water is overall more sustainable because it has much higher area and perimeter. Which of the three E’s is the rated the highest for bottled water? Which of the three E’s is rated the highest for tap water? Why do you think this is? Answer: For bottled water, social equity is rated highest because bottled water is extremely convenient, when traveling or on the go. Many people think that bottled water is safer than tap water, so it is also used in homes or in countries where the water safety is risky. For tap water the highest rated was 2.5 in economics, I think this was because tap water is 300 times less expensive than bottled water, making it a lot easier for people to get. 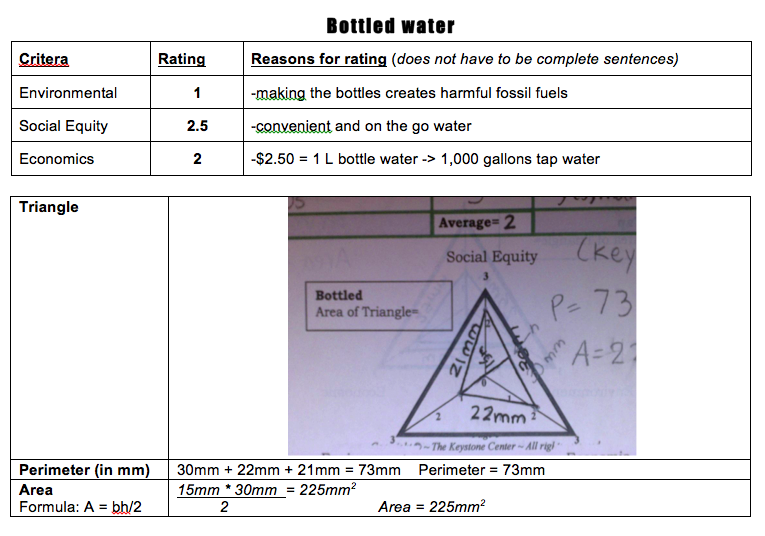 Explain how the size and shape of the triangles can tell us about the sustainability of bottled water and tap water. Answer: If the size and the shape of the triangles are relatively even then the triangle would have a balanced sustainability. For example, the tap water triangle was more even than the bottled water triangle, and its ratings had a smaller range 1.5 to 2.5, for this reason it has a more balanced sustainability. The bottled water’s ratings had a larger range 1 to 2.5, which caused its sustainability to favor towards the social equity side. However, just because the tap waters triangle had a smaller range, and a more balanced sustainability, it isn't necessarily better than the bottled water. Because the tap water could have been rated very low in each of the three “E’s” which would make it have a balanced sustainability, but not a high sustainability. Tap water is more sustainable because it has the an area of 350mm2 which is 105mm2 larger than the bottled waters area, which is the overall sustainability. Bottled water only had an area of 225mm2 and a perimeter of 73mm. I was not surprised by the results of my analysis because although I knew that the the social equity rating was a high 2.5 for bottled water and that the economics would be relatively high with a rating of 2, I knew that the environment rating would be quite low. And I knew that the for tap water it would be more even overall. When we were doing the research it is possible that we could have been using faulty websites, which would be a big error, or one error that would be do to the different groups being biased based on their decisions of how to rate the different areas. Another error that could have been made by many is that when a rating was rounded to the half the dot on the triangle could have been placed in different places for many, which would throw off the area and perimeter of each triangle.